Barred Puffbirds, Rufous-tailed Jacamars, White-headed Wrens and many more make up a distinct dawn chorus like no other in Panama. Located in Central America’s most diverse and least-explored region, the Darién province of Panama is a birder’s paradise. 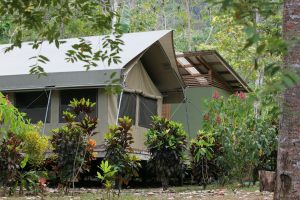 Situated in the humid lowlands of far eastern Panama, near the end of the Pan-American Highway, at the new Canopy Camp you can feel the wilderness around you, from just a step outside your tent. Towering giants – Cuipo trees – provide a panorama of Darién, and are in clear view above the forest canopy, right from your tent. 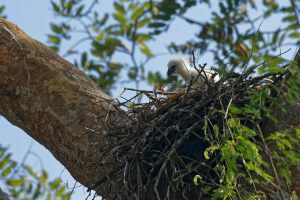 It is in these enormous rainforest giants that Harpy Eagles and Crested Eagles place their nests and raise their young. While you sip your morning coffee, listen for the buzzy trills of Golden-headed Manakins lekking in the forests beside the camp. A walk with your knowledgeable guide will be thoroughly awe-inspiring and entertaining. From tiny, colorful poison dart frogs on the forest floor to Red-throated Caracaras in the canopy above, these forests are full of life. At the end of the day of exploring the region, settle into your tent and doze off to the calls of owls, potoos, nightjars and a symphony of frogs, bidding you good-night from the forests of Darién. 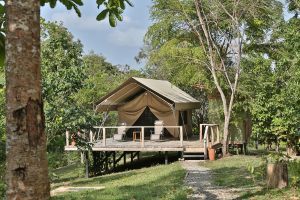 While enjoying the wilderness of Darién all around us, camp in comfort in custom-designed African safari-style tents with all the amenities we offer at our other ecolodges. The province of Darién is revered for its incredible wildlife and blessed to have an immense expanse of protected rainforest in Darién National Park. 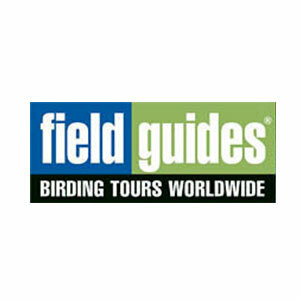 It is one of the least visited and most valued areas for birding and wildlife watching in Central America. It is literally the end of the highway in Panama – the Pan-American Highway, which extends from Alaska to Tierra del Fuego, with only one small gap between Panama and Colombia – the Darien Gap. The protected Darién jungle provides a stronghold for the Great Green Macaw, Great Curassow and the majestic Harpy Eagle, Panama’s national bird, as well as other endangered wildlife including Colombian Spider Monkey, Baird’s Tapir and America’s most powerful cat, the Jaguar. However, Darién has suffered greatly from extensive deforestation throughout most of the province, as agriculture and cattle are the major sources of income for the people. 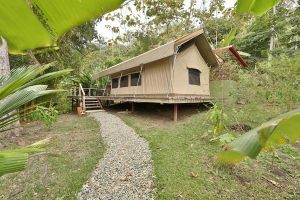 We have established the Canopy Camp in this sensitive area to raise awareness of the potential that ecotourism has for Darién—creating a source of direct and indirect jobs and income for the local people, offering educational opportunities in the communities and promoting environmental conservation. Our location, next to the protected forest of the Filo del Tallo Hydrological Reserve (65,000 acres) will also contribute to the conservation of this important area as our presence is a deterrent to poachers and loggers. 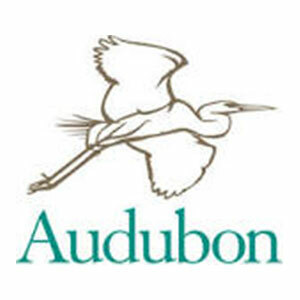 This reserve also provides us with ready access to a mature forest and its wildlife. 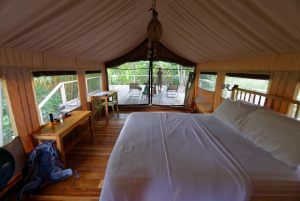 The Canopy Camp really is one of the best opportunities for ecotourism in Panama! 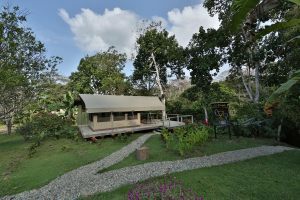 What is unique about the Canopy Camp? 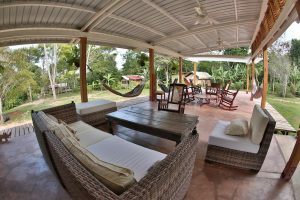 The only tented ecolodge in eastern Panama! 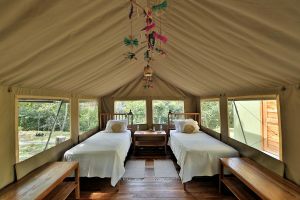 The Canopy Camp has 8 full-size African Safari-style tents on raised platforms overlooking the vast landscape of rural Darien province and nearby Filo del Tallo Hydrological Reserve. 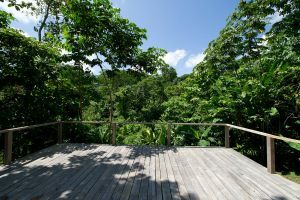 In proper Canopy Family style, the open air dining room and lounge offer constant connection to nature – hummingbird feeders are buzzing with activity and platform feeders attract tanagers, butterflies and monkeys just meters away from the common space. 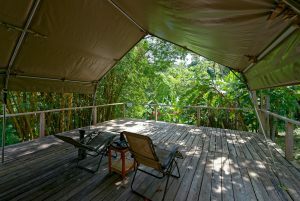 Furthermore, the Canopy Camp gives access to some of the best birding that Darien has to offer. Harpy Eagles have been spotted right from the lounge! What is special about Darién? Darien is Panama’s easternmost and most underpopulated province, bordering Colombia. Darien is famous for the Darien Gap, where the Pan-American Highway comes to an end in the town of Yaviza, giving way to the vast jungle of Darien National park – the largest national park in Central America – 572,000 hectares of protected rainforest, rivers, mountains and a stronghold for wildlife including Harpy Eagles, jaguars, tapirs, spider monkeys and many other rare species. Many regional endemics and range-restricted species of birds are found in Darien, providing rewarding sightings for birders and photographers. Darien is also home to many of Panama’s Indigenous people, with large reservations called comarcas, and they influence much of the local culture in the region. What species can be seen commonly around the Canopy Camp? The grounds of the Canopy Camp are rich with bird and animal life right outside your tent! Chestnut-headed Oropendolas are usually nesting above the common areas, Long-tailed Tyrant, White-headed Wren, Black-tailed Trogon, Black-cheeked Woodpecker, Streak-headed Woodcreeper, Cinnamon Becard, King Vulture, Spot-crowned Barbet, Olivaceous Piculet, Golden-collared and Yellow-headed manakins and Red-throated Caracaras, among many others, are common around the property. At the hummingbird feeders and flowering gardens, Pale-bellied Hermit, Blue-throated Goldentail, Black-throated Mango and White-vented Plumeleteer are common, and at times during the dry season even Ruby-topaz Hummingbird and Rufous-crested Coquette make appearances! After dark, Black-and-white Owl, Mottled Owl and Great Potoo are frequently heard and occasionally seen. Can I come for a shorter duration than the set 7-night tour package? Due to the distance from Panama City, logistics and incredible birding opportunities, we highly recommend a full week at the Canopy Camp. Some of the tour companies that visit us offer shorter stays, but a staying for less days reduces the amount of time to bird in the area and the number of regional specialties you may see. However if you are unable to stay for the full package, please contact us and we will do our best to accommodate you. 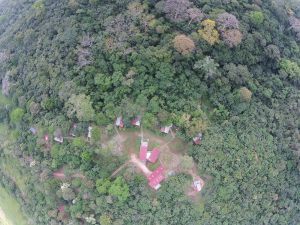 Can I visit the Canopy Camp without booking a tour? 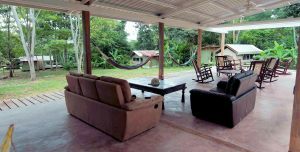 Darien remains very rural, is relatively under-birded and new to tourism compared to the rest of Panama and the Americas, it is highly beneficial to go with a guide who knows the ins and outs of traveling in the area as well as the species found. 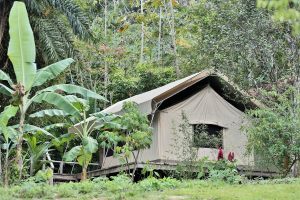 We do not offer stays at the Canopy Camp outside of the all-inclusive packages available, but occasionally exceptions are made; please contact us for more information. For more answers to general Canopy Family FAQs, please visit our Frequently Asked Questions page. 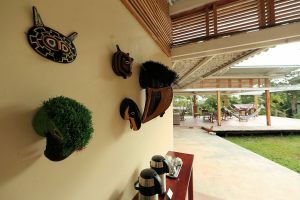 To make your stay with us the best possible, here are some essential items to consider packing for Canopy Camp Darien. 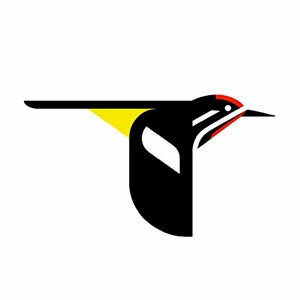 If you have any further questions about this birdwatching tourism opportunity, please let us know! "Raul and Denise, thank you for our time here at Canopy Lodge. It is an extraordinary place with such lovely people running it. We hope to be back very soon." 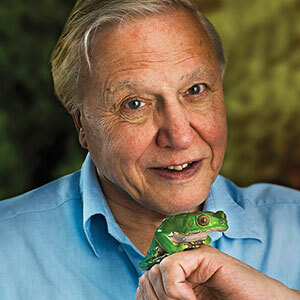 "...lovely rooms, excellent food and fascinating wildlife." The Canopy Tower is unique in the World and splendid in both its conception and its execution. The Cornell Lab of Ornithology may well break its rules of not "repeating" and return to your wonderful Tower and gracious hospitality." 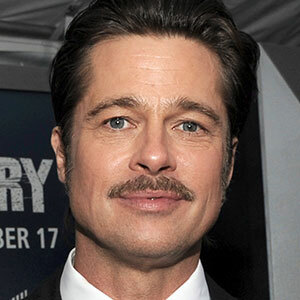 "Raul, we have come to believe we have found the soul of Panama in your family and your lovely place. Thank you for the experience." 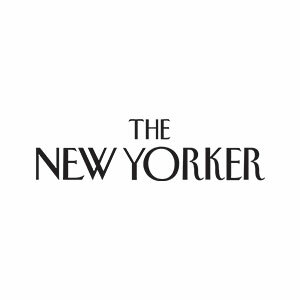 "...grand in conception ...superbly realized..."
"... a luxurious living and dining experience with superb birding and, perhaps most important of all, a wonderful lesson in conservation. A few days at Canopy Tower will install an environmental ethic in all who pass through." 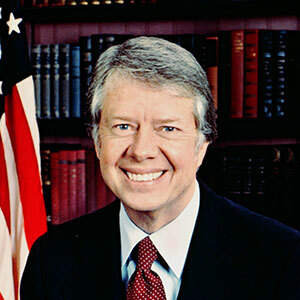 "Raúl, what you have done here in the Canopy Tower makes me doubly proud of the Torrijos-Carter Treaty and its beneficial and just results. 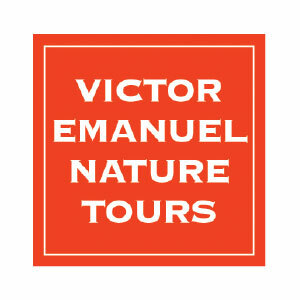 We wish you well as you introduce hundreds of visitors to the beauties of Panamá's natural resources." 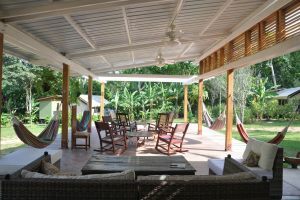 "...exceeded all expectations ...beautifully done ...everything is first class"
"Raúl, you have a truly wonderful place. I loved coming here during my stay in Panamá; for the solitude and peace of it, for the great food and for your company, always lighthearted."